Many years hence, the Blood God lies close to bleeding out: the coffers of The Great Toady One have ceased to fill and are draining slowly, and all too soon he will become unable to continue his great work. And when that happens, the world as known will come to an end: all things shall perish and be forgotten. But you cannot let this pass. Long ago, there were many mighty heroes, enduring characters, daring feats of engineering, and legendary stories, awesome testament to the scope of the great work. The power of these tales and figures drew people, showed them the great truth and worth of the endeavor, and so it was continually supported and renewed, legend begetting legend and greatness begetting greatness. Were another great saga to arise from the crumbling splendor of the work, surely its spark would be renewed and the dormant heart would once more pump blood for the blood god. But it would have to be the greatest saga of all time. And that is your plan. You shall create the greatest hero of all time, an adventure to outshine them all. The only way you can think to do this is to travel to all the places of legend, and conquer them all, so that their fame passes to you. You first set about to begin your hero through the usual process -it is only fitting, after all- but soon realize: should you fail, should you die early on as so many do, all hope will be lost. No. You will try again, persevere past even the ultimate obstacle, so that your hero shall truly be the most enduring, steadfast one of all - for that is the basis of all other greatness. 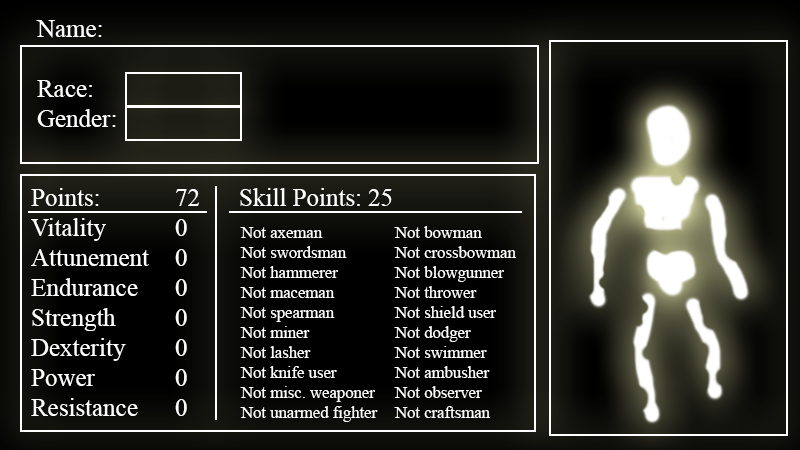 Attributes - These mainly affect stats and equipment usage. For those familiar with this system, there are 2 minor tweaks: resistance is no longer useless and power is a unified stat for making magic stronger. They can be increased, 1 at a time, on level-up, but are capped at 15 in character creation. 1 Stat may be increased per level up. 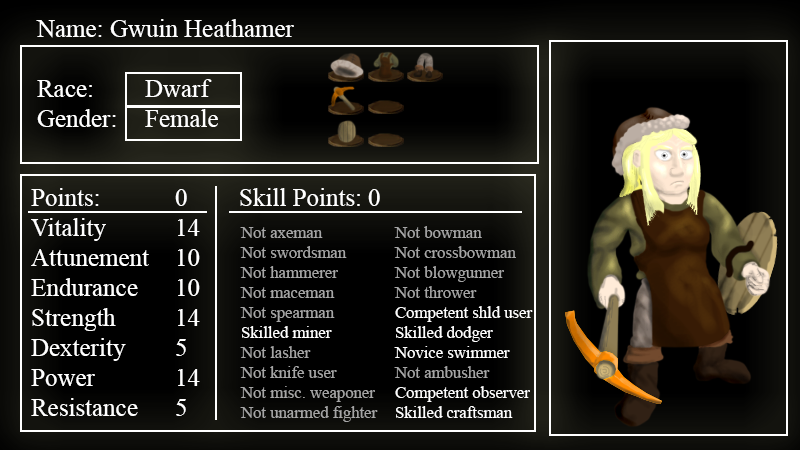 Skills - These will mainly determine your starting equipment but will also affect how certain actions turn out. They can be increased with practice. In character creation, it's 1 point per level, with level 1 being novice and 16 and up legendary, but you can only start them up to professional (10). After character creation, skills can only be increased through practice. More mechanics will be explained as they become relevant. You should probably focus on background, appearance, race, gender and all that first. So, is this an illustated (modded)adventure mode kind of thing? Some spin on whatever systems dark souls uses? 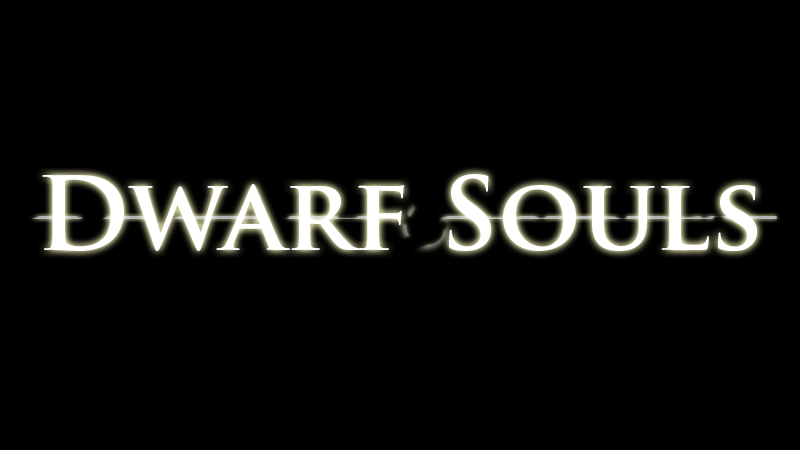 Well, not an actual adventure mode game, but a suggestion game using a combination of DF and Dark Souls systems. Since it's a DF-inspired story, I'm not sure whether to put it here or in Forum Games and Role Playing. I'd say here's fine. There are enough interactive adventures here for it not to be the odd duck. So are we supposed to suggest a point distribution? Do we get 5-6-7 for novice, adequate, competent, or is it one point per level? I suggest dumping everything in vitality/endurance and swimming as to become a great diver. Edit: I should mention that I don't know a lot about dark souls, let alone its mechanics. That's fine. You can be authoritative on the adventure mode skills. It's 1 point per level, with level 1 being novice and 16 and up legendary, but you can only start them up to professional (10). I'd like to offer a hero. Short description: A short, tough-looking dark-haired man. He's used to walking long dictances and carrying heavy backpacs. He also went through basic legionnaire training. He prefers bronze plate armor and steel weapons. Edit: Wait, what's the system? Does it mean that we get peasant skills or what? Skills - These will mainly determine your starting equipment but will also affect how certain actions turn out. They can be increased with practice. In character creation, it's 1 point per level, with level 1 being novice and 16 and up legendary, but you can only start them up to professional (10). Hmm.. Maybe a magic focussed build? Stats are capped at 15 for character creation, though. I support use of this character. Since it's a DF-inspired story, I'm not sure whether to put it here or in Forum Games and Role Playing. I'd say to put it under Forum Games and Roleplaying. While it is DF inspired, the apparent way this game will be run is more fitting for the Forum Games and Roleplaying board. Especially since the DF Community Games and Stories is more centered around succession games and stories of events within dwarf fortress, rather than for hosting games based on the dwarf fortress system. Simple. The GM can throw everything towards our weak points since he has a much larger time to consider the response to our actions.